How do I use the Rich Content Editor in the Student app on my iOS device? 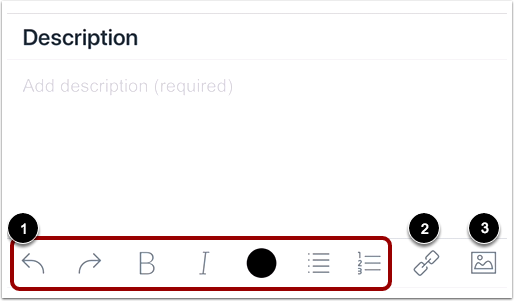 You can use the Rich Content Editor to edit and format text in the Student app. The Rich Content Editor is available in Announcements and Discussions. You can use the Rich Content Editor when editing posts and replies in Announcements and Discussions. The Rich Content Editor allows you to format text , add links , or attach images . You may have to swipe your screen to the left or right to view all Rich Content Editor icons. To undo your last action, tap the Undo icon . To redo what was previously undone, tap the Redo icon . To bold text, tap the Bold icon . To italicize text, tap the Italics icon . To stop using bold or italics formatting, tap the Bold or Italics icon again. To change the text color, tap the Color icon . Then tap the color you want to use . To format text as a bulleted list, tap the Bulleted List icon . To format text as a numbered list, tap the Numbered List icon . To add a link, tap the Link icon. 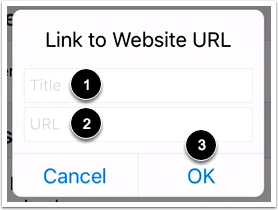 Enter the link title in the Title field  and the link URL in the URL field . Then tap the OK button . To attach an image, tap the Image icon. Then tap the Add icon. 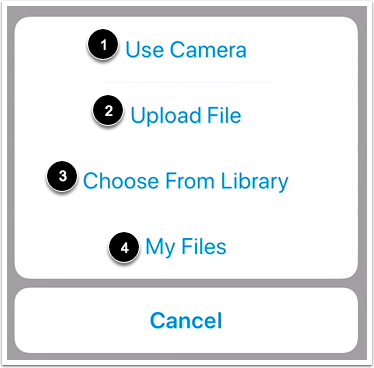 Use Camera : take a picture from your camera. Upload File : upload a file from your device. Choose From Library : select an image from your photo library. My Files : select a file from your personal Canvas files. 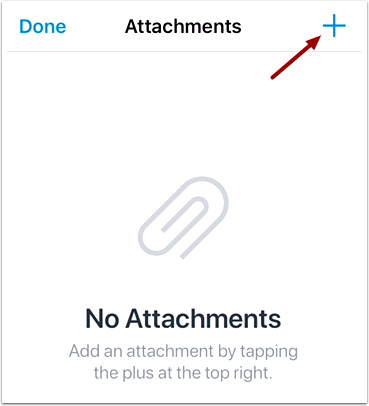 Once you have selected your image, it will display on the Attachments page . To delete the image, tap the Delete icon . To add another image, tap the Add icon . Previous Topic:How do I view Notifications in the Student app on my iOS device? Next Topic:How do I view the To-Do List in the Student app on my iOS device? Table of Contents > App Features > How do I use the Rich Content Editor in the Student app on my iOS device?